When earth and heaven pass away, it is with a "roar" and "intense heat" (2 Pet 3:10-12), and the apostle John sees a new heaven and a new earth. The new heaven is the atmosphere about earth, and it no longer has the sun or moon (Rev 21:23). The new earth no longer has any sea (Rev 21:1). As the apostle witnesses a new Jerusalem coming down out of heaven from God (Rev 21:2, 10), he hears that "the tabernacle of God is among men" and that "God Himself will be among" the resurrected saints (Rev 21:3). The city itself is a square cube; its width, length, and height measures about 1400 - 1500 miles (Rev 21:15). The city and its streets were made of pure gold like clear glass (Rev 21:18, 21). The walls surrounding the square city are about 200 feet thick (Rev 21:17) and made of the precious stone jasper that was crystal clear (Rev 21:11, 18). There is no temple in the new Jerusalem! God and His Son are effectively the temple (Rev 21:22). In the Old Testament, the tabernacle was a portable tent that was divided into two rooms, the Holy Place and the Holies of Holy. Known as the "tent of meeting," the tabernacle was recognized as the meeting place between God and the His people (Ex 40:34-35). When Solomon’s Temple was built, the Holy of Holies had the dimensions of a cube: 30 feet x 30 feet x 30 feet (1 Kings 6:20). It is significant that there is no temple in the new Jerusalem; it is the heavenly Holy of Holies. New Jerusalem is shaped as a cube. New Jerusalem is constructed with the finest materials and craftsmanship. New Jerusalem is the place where Believers are in God’s presence, and as glorified Believers, see His face (Rev 22:4). The heavenly Holy of Holies, new Jerusalem, descends from heaven with the glory of God (Rev 21:11) and Believers, completing the process of salvation, are raised and resurrected in glory (1 Cor 15:42-44). 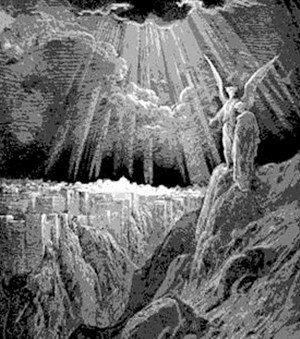 It is in this context of God’s glory adorning both new Jerusalem and the Believer that the apostle John introduces the "new Jerusalem, coming down out of heaven from God, made ready as a bride adorned for her husband" (Rev 21:2).